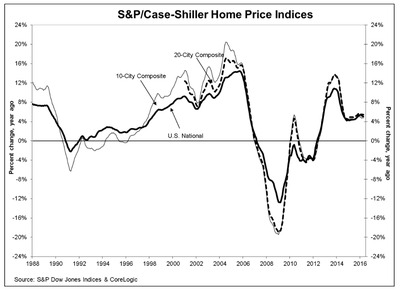 Home prices rose less than expected in April, according to the S&P/Case-Shiller home price index. Prices in 20 major cities rose 0.45% month-over-month and 5.4% year-over-year. Economists had forecast that the 20-city index rose 0.58% month-over-month for April, according to the Bloomberg consensus. And compared with the previous year, they forecast a 5.41% rise. Prices compared with last year rose the most in Portland, Oregon; Seattle; and Denver. 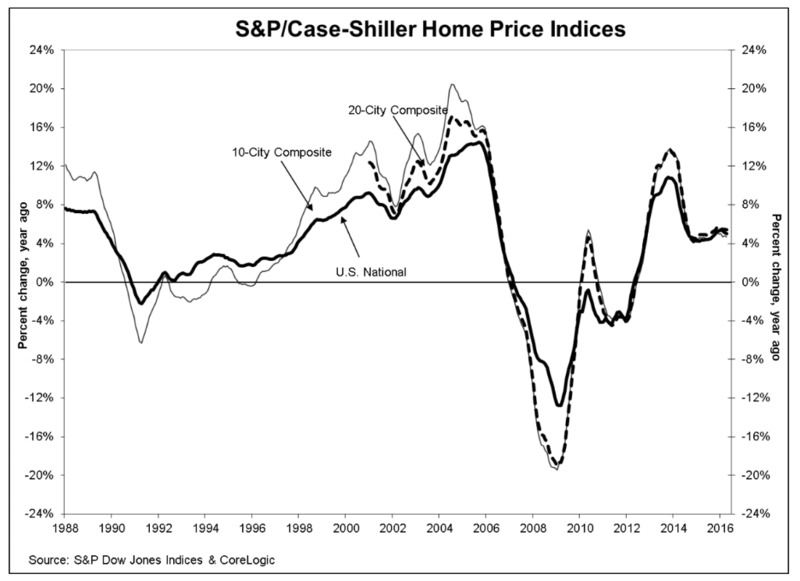 “The housing sector continues to turn in a strong price performance with the S&P/Case-Shiller National Index rising at a 5% or greater annual rate for six consecutive months,” said David M. Blitzer, managing director and chairman of the Index Committee at S&P Dow Jones Indices. Blitzer also noted that some of the details in the data “hint at possible softness,” including seasonally adjusted figures showing that three cities actually saw lower prices in April, an increase from one in March. Moreover, looking under the hood, there is a “growing divide between the top and bottom of the market that the Case-Shiller numbers don’t reveal,” Zillow chief economist Svenja Gudell wrote.